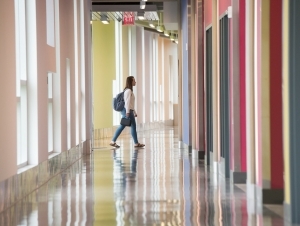 The renovation of Buffalo State’s Science and Mathematics Complex (SAMC) is a mathematical marvel of its own—one composed of four intricate phases that must come together perfectly to make a renovated whole. That final equation is expected to be complete at the beginning of 2021 when Phase 4 of the extensive renovation project that began in 2009 is finished. The new SAMC—a 224,000-square-foot facility spread over three levels—will be home to the Biology, Chemistry, Earth Sciences and Science Education, Mathematics, and Physics departments, the Great Lakes Center, and a state-of-the-art Whitworth Ferguson Planetarium. Designed by Cannon Design, the renovations are expected to cost more than $110 million, with $35.5 million dedicated to Phase 4. The majority of the project was paid for out of state funds. “This is our most ambitious construction project in decades. 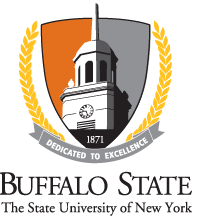 It’s also one that will greatly enhance the programs that are housed in the building and the campus as a whole,” said Steve Shaffer, Buffalo State’s director of facilities construction and maintenance. After demolishing the south wing of the original 56-year-old building, workers began construction of the final stage of renovations in July. Phase 4 adds classrooms, a greenhouse, study space, faculty offices, and research labs for biology, chemistry, and earth science. The final addition will connect the main entrance and lobby to the three-story atrium. Inside the lobby will be the spherical stand-alone planetarium. The lobby also will house a cafe and seating area. Landscaping for the complex will be completed in this phase. The new planetarium, replacing the temporary one now housed in Buckham, will be a key attraction. With a digital projector that can handle fully immersive movies, the new planetarium will offer students and visitors a chance to see the stars from the vantage point of Earth, as well as travel to other planets and galaxies, said Kevin Williams, planetarium director and associate professor of earth sciences and science education. A $1 million gift made during Buffalo State’s initiative Transforming Lives: A Campaign for Buffalo State supplemented the state funds for the new and improved planetarium. The gift will pay for a star projector, new programs, and an endowment for upkeep. Other disciplines, such as biology, can use the planetarium, for instance. “Besides programs related to cells and evolution, it will have the kind of software used by medical schools to look at the human body and slice through the different systems,” Williams said. Programs open to the public are expected to continue and eventually expand. Overall, he said it’s exciting to see all the changes throughout the SAMC.